I first came across curry leaves in Columbia, Maryland, in an Indian grocery store. Set in the cooler, next to quarts of yogurt and packages of paneer were these glossy almond-shaped, deep green leaves, set alternately on gracefully curved narrow stems. 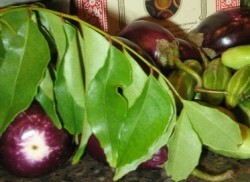 They looked somewhat like bay leaves, but they were not leathery enough in texture–these were soft and very thin. When I opened the cooler an odd, strong musty smell overtook me. It wasn’t unpleasant at all, but quite compelling. I reached in and took out one of the bags and held it to my nose. Yes, the leaves were the source of the smell. But I had no idea what they were, only that I liked the smell of them. I shrugged and turned to put them in my basket, along with masoor dal, black cardamom and fresh chiles. Next to me was a tiny older woman in a blue and gold sari. Her long white hair was braided down her back into a rope as thick as my forearm. She smiled up at me and nodded. “You like them?” she asked. I nodded avidly, urging her on. Her daughter came up to her; it was apparently time to leave. Bowing to her, I thanked her profusely, and we waved goodbye cheerily, as I turned to my shopping and she bustled after her daughter and grandchildren. Curry leaves are from the plant, “Murraya koenigii,” which grows as a shrub or tree all over South India. I am told that the young plants are easy to grow in the house; I will have to try this, though while I have a wonderful green thumb when it comes to outdoor plants, my indoor plants sometimes fall prey to munching cats or my own forgetfulness. As my unnamed benefactress at the Indian grocery all those years ago said, curry leaves are used to enhance many different curries in South India. Monisha Baradwaj, author of The Indian Spice Kitchen, which is one of my favorite reference cookbooks for Indian food, says that while Northern Indians use fresh mint with a free hand, the people in Southern India use curry leaves with joyful abandon. I have been using them more and more, and whenever they are available, I buy them up greedily. When I have too many, I will freeze them. They lose some of their fragrance, but not all of it, and I use them especially for dals after they are frozen to good effect. Most of the time, curry leaves are removed from the dish they are cooked in prior to eating them, but I also know of recipes where they are eaten. I have eaten them with no ill effect–they are a little bitter, but then, I am fond of bitter melon, so a little, slightly bitter leaf is nothing to me! The recipe I am presenting today is a quickly fried curry of chicken and potatoes that uses curry leaves, ginger, chiles and black pepper as the main flavorings with a single black cardamom pod, cloves, and coriander to round out the masala. At the end, I added two teaspoons of tamarind concentrate to give the curry a liltingly sour finish which complemented the curry leaf musk and the pepper, ginger and chile heat perfectly. Make your garam masala: Grind the first five ingredients together into a fine powder and set aside. Heat oil in a wok or heavy bottomed skillet until melted and quite hot. Add ginger and chile, and stir fry for about thirty seconds, or until it just becomes quite fragrant. Throw in the curry leaves and stir. They will pop, fizzle and crackle as their juice is released into the oil. Stir carefully until they begin to curl up and turn brown–about thirty seconds. Add chicken in a single layer, and leave still to allow it to brown a bit on the bottom. 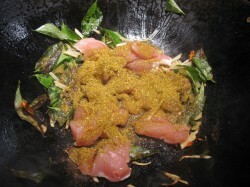 Sprinkle the masala over the chicken and as soon as you smell the chicken browning, begin stir frying. Add the potatoes, and keep stir frying. When most of the pink from the chicken is gone, add the chicken broth or water, and turn the heat down, and allow it to simmer to cook the chicken and potatoes through. My mothers gave me a small tree a couple years ago that is also apparently called a curry tree, but the leaves are longer and slimmer and don’t have that pungent goodness of which you speak. When I cooked with them, the flavor was so mild as to almost be imperceptible. It’s certainly easy to grow, though, even outdoors (in the SF Bay Area, at least). That’s one of the wonderful things about shopping in an Indian grocery store, isn’t it? When we recently bought yellow lentils to make Dhansak, the lady at the checkout desk proceeded to tell us how to cook the lentils to make dahl. As for curry leaves, I too love them. They are used a lot in Thai cookery as well, I believe. And certainly, or at least as far as I’m concerned, they are an essential ingredient in a Thai green curry. I had a slow growing very little curry leaf plant growing in a pot for a couple of years but it didn’t survive one particularly cool and cloudy summer. The leaves were tiny and while they did have the right flavour and aroma, I would have had to strip the whole plant in order to flavour just one curry. I’m now sticking to buying branches at the grocery store…. It’s not easy to find a plant either; there is another plant that is also called curry leaf “Helichrysum italicum (H.angustifolium)” that has a rather unpleasant aroma vaguely reminiscent of commercial curry powder but virtually no flavour at all. This imposter looks a bit like rosemary. So it is really important to ask at the plant center for “Murraya koenigii”. Oh yes and don’t let me forget! 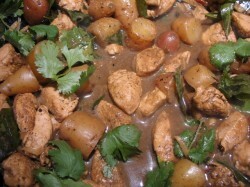 Your chicken curry looks great. What a great post about curry leaves. I will look for them at the Indian market in Salt Lake. Love the idea of adding some tamarind, I love tamarind. I’ve mostly had it in Vietnamese or Cuban food, but it sounds like it would be wonderful in this. Mutter Paneer followed by curry leaves. ok – i am going to buy a curry plant too. I am hopeless with all plant’s but luckily Fred is not. Curry plants are a little tricky in the US. They need heat. I live in (northern) California, and I found that mine just languished a bit unhappily before it died. Happy enough in the summer, but not at all happy in the wet winters, and eventually it dies after the shock of the move to my new house. After 2 years it had only grown three inches. So I find it easier to buy it fresh from the Indian store. Sigh. PS to Elizabeth – curry leaves not used in Thai cooking. Those are kaffir lime leaves and are quite easy to grow if you live in a region that will grow citrus. they also do well in pots. I got a kaffir lime tree from Four Winds Nursery a few years ago and have been amply rewarded with leaves and kaffir limes for sublime green curries. Nice post! I have a suggestion though…when you have more curry leaves than you need, you might want to consider sun-drying (or oven-drying if you dont get much sun) your extra curry leaves rather than freezing them. They retain quite a lot of flavour that way. I wasnt sure of being able to find them in the US, and one of the things my mother lovingly sent with me from home as I was leaving was a lot of dried curry leaves. Actually, sun-dried is wrong…they were shade-dried…the leaves lose their colour if you dry them in the sun. Diane, I knew that kaffir lime leaves were used in Thai cookery but I could have sworn that when a Thai fellow showed us the various ingredients that had gone into a green curry served at his restaurant, curry leaf was among them. Perhaps I misheard him. English was new to him then and we might have thought what he was pointing to was a curry leaf, having seen and tasted them in Indian cuisine. Or perhaps he was Thai with some Indian ancestry? Still, it would surprise me if curry leaf weren’t used all over south Asia…. I had good luck with a kaffir lime in my office…on the window sill. That is until the window cleaners sprayed it with ammonia or something. It had blooms and limes (very small) and I was able to harvest a few leaves quite frequently. After the spraying debacle, it perished. An office sill with good light seems like a good place for plants, as they turn the heat off at night-unlike a home-but it never gets near freezing. Maybe I’ll try growing curry leaves-my little Meyer Lemon is growing nicely, but of course will never have more than 1 or 2 lemons at a time. ….but when the main thing is the leaves, you can do pretty well. Mark–it sounds like you don’t have “Murraya koenigii,” but instead have the copycat plant. It is a shame that it doesn’t grow very fast, Brian–as a houseplant in my house that is likely the kiss of death. Besides, several of my cats like the smell and taste of the leaves, so that–more than anything–would doom it. Minnaloushe, the little cat who died in October, was particularly dangerous with edible plants. She once ate an entire bouquet of basil I had left on the counter while I went out to pick more. Good thing I picked more, eh? Elizabeth, there are a lot of leafy herbs used in Thai cookery and there are many regional styles of cookery. 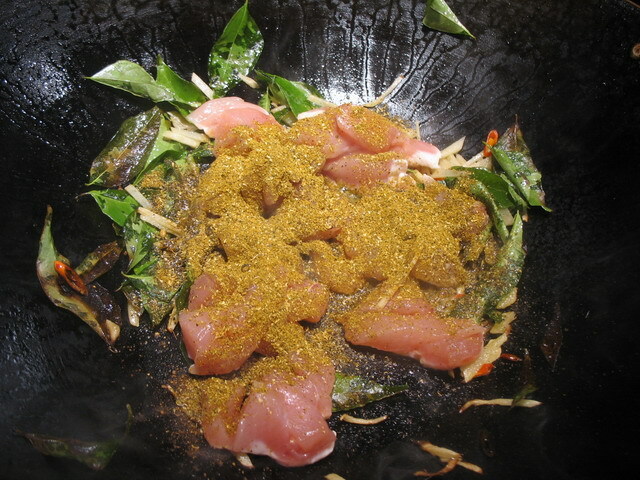 There are also a number of Thai people of Indian descent–that may be where the curry leaves came in from your source. But, I have not noticed them in any of my researchers into Thai cooking. But, again–there are many vast differences in the regional cooking styles, so that could account for it. Kaffir lime leaves–I sense another WHB coming on! They are one of my most favored of flavoring ingredients. They smell like flowers to me! Kalyn–tamarind and curry leaves are a classic combination. You will have to try it. Sam–cool. I will have to see if I can keep up my roll! Diane–a kaffir lime plant would survive my house longer, perhaps. The cats don’t like those. I have been trying to get up the courage to try to grow them. You and Lindy have inspired me…. Thanks all! Glad you enjoyed the post. Curry leaves…my favorite herb/spice ever! They add that amazing freshness to a dish…I really enjoyed reading your post. I love their flavor and fragrance, too. Yes, I too noticed that about curry leaves when I googled about them in Thai cooking. Only one page of many even mentioned that they might be used in Thai cookery. We went to a nearby Indian grocerystore on the weekend to be sooji (we use sooji for making fresh pasta – it’s much less expensive than buying semolina from Italian grocers and as far as we can tell, it is the same thing). I looked in their fridge for curry leaves. Alas, they didn’t have any. I guess I’ll have to head over to Indiatown. I’ll do it as soon as the snow clears from the roads, so I can ride my bike. Now, the overwintering plants are kept under lights in the basement. There is a sign on the basement door reading “No Cats Allowed”. Guess which creature in our house pretends he can’t read and watches for any opportunity to slip by when the basement door is open…. Ah curry leaves!! love ’em, love ’em, love ’em. Used to be that you couldn’t find them that easily and I used to miss their fragrance in all my indian dishes. Now our local indian stores carries them and I use them in everything. It’s one item I pick up unfailingly every week. I’ve been lurking in your blogs for a couple of weeks now, enjoying your various posts and recipes. This is the first time I’ve made a comment! I set up my own blog recently. Stop by http://saffronhut.blogspot.com sometime. Thank you for commenting, Saffron Hut. I adore curry leaves, too! I am glad that you liked the recipe–though I have to say, in all of my recipes, the chile amounts are “to taste.” That means, if you are not used to so much chile, you don’t have to use it all! Do you live in Columbia? That’s where I am from. I would have loved to find Indian grocers there when i was growing up. I lived in Columbia for about three years–now, I am in Athens, Ohio, where I plan to stay from now on. Im desperatley looking for a curry leaf plant to grow. Live in ohio. Do you know where i can buy a plant from. Sabrina, try Companion Plants. They are here in Athens, and they do mail order–be certain to ask by botanical name as there are several plants known as curry plants. I have a kadipatta plant which always died in the winter and in spring it grew no mare than 3 inches.this summer i moved the plant to sunnier location,where it gets more than 6 hours of sunlight.i also changed the soil to black loamy soil,also i only water the plant once or twice a week .so in 2 months my kadipatta grew to more than 12 inches and is still growing .The plant looks nice and green.so few things i learnt is kadipatta doesn’t like too much water,likes lot of sunlight,likes good soil and has to be moved indoor during cold months.Try this and your kadipatta will grow great. Can you please tell me how to harvest my leaves from my curry leaf tree. Do I remove them individually or cut the whole stem. You can do either–if you are harvesting just a few for one dish, pluck the leaves individually. If you want a lot of them to freeze, then pluck them by the stem, they will stay fresher longer.